Glenwood Leadership Academy fourth grade teacher Amber Santana leads her students in multiplication drills while pacing across their desktops. Santana is in her second year at the school. 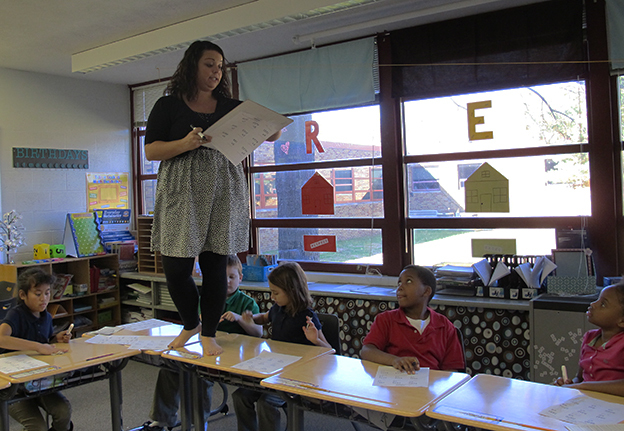 Her shoes kicked off, a white board in hand, teacher Amber Santana is leading multiplication drills with her fourth graders at Evansville’s Glenwood Leadership Academy — while standing on their desks. Standing just outside the third-year teacher’s room, Glenwood principal Tamara Skinner smiles. “I realize that’s a bit unorthodox,” Skinner says, but Evansville Vanderburgh School Corporation leaders say that’s the kind of vitality they hope to see in its staff — vitality that’s key to turning the troubled school around. Teachers were burning out when Skinner took the principal’s job at Glenwood last school year. The school had a discipline problem. Its student body turns over often as kids from the largely-poor neighborhoods on Evansville’s south side moved from school to school. With one of Indiana’s worst passing rates on last year’s statewide tests, Glenwood is all but assured its sixth straight F — leaving state officials with a decision to make before this school year is over. Glenwood Leadership Academy principal Tamara Skinner visits teacher Amber Santana's fourth grade classroom. The school serves students in grades K-8. But Evansville school officials have already launched their own effort — with a new district turnaround office and a $600,000 contract with a Massachusetts-based school turnaround group at its center — to improve Glenwood and four other schools in the district that received F’s last year. Another Partnership Or ‘More Noise’? State superintendent Glenda Ritz says all options are on the table for State Board of Education members to consider. “I’ve already been on record, before I ever took office, that I don’t believe takeover is the answer,” Ritz told StateImpact, although she didn’t otherwise tip her hand to which options she prefers. Between leaving the district’s plan relatively untouched or outright takeover, the State Board has a third option: hiring an outside company — a “lead partner” — to offer intensive assistance in turning around the school. Hillyard says the district worries about putting too many cooks in the kitchen. “I have a hard time believing adding another partner, adding something else to it would not have the reverse effect at this point,” Hillyard says. Near the end of last school year, Evansville school officials put their plan in motion. They started with a “teacher recommitment process,” asking all 48 Glenwood teachers if they wanted to stay at the school or transfer to another position in the district. More than one-third of the teachers asked for a transfer right away and others eventually left too. Those who stayed got intensive training. Glenwood’s staff is less experienced now, but Magunia says the infusion of new blood has given the school fresh start. 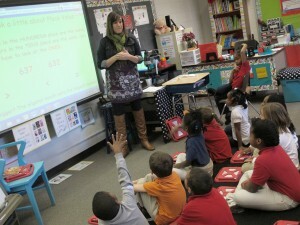 A second-grade Glenwood teacher leads a math lesson. “The teachers that are now at Glenwood want to be there — 100 percent want to be at Glenwood. Which is something that I can’t teach,” Magunia says. From there, the turnaround team built a data management tool to track students’ performance and teacher objectives. Before, much of teachers’ practice was “based more on feeling than knowing.” Now, Hillyard says the data management tool — a massive spreadsheet for teachers in each grade — has helped teachers re-engage with the raw numbers of their students’ performance. “We’ve taken the ‘feeling’ out. 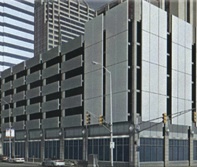 They should have the data they need to know how they’re doing,” Hillyard says. Avoiding state intervention at Glenwood isn’t Hillyard’s only incentive. She reports directly to the district’s superintendent. Part of Hillyard’s own performance evaluation rides on the test scores of the five schools she oversees — including Glenwood. Under her contract, the five schools’ passing rate must go up by 10 percentage points this year. Evansville district leaders spent last school year planning the turnaround effort. During that year, the school’s pass rate on the ISTEP+ tumbled nearly nine points — from 37.2 percent to 28.6 percent. What Are The State Board’s Options? There’s a huge span of options for the board to consider, from letting initiatives that are currently in place continue to happen, if you’re seeing growth; to putting in additional, supplemental pieces to that; to takeover. I’m sure the State Board of Education will make a good decision regarding that, you know, depending on if they feel Glenwood is making some progress and is sincere to, within the school corporation, making that happen.